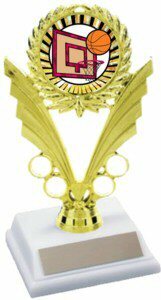 Economical basketball trophy, makes a great participation award. Customize your trophy by choosing your base and insert. This figure can be mounted on any traditional trophy, call 1-800-203-1658. Three lines of free custom imprinting.